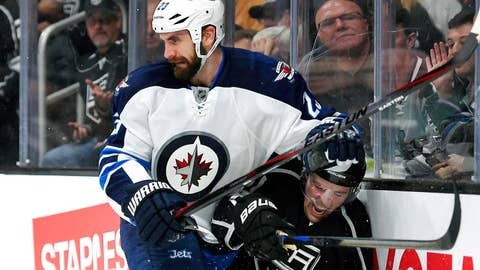 Kings left wing Tanner Pearson (right) was injured battling Jets defenseman Jay Harrison on Staurday night. Los Angeles Kings rookie forward Tanner Pearson is out after reportedly suffering a broken ankle during Saturday night’s 5-4 loss to the Winnipeg Jets. Earlier Saturday, Pearson was selected as one of six rookies to compete in the All-Star skills competition on Jan. 24 at Columbus. He suffered the injury during the second period on Saturday night. He went into the end boards while being checked by Jets defenseman Jay Harrison. According to the Los Angeles Times, he suffered a broken ankle on the play and is scheduled to have additional testing on Sunday. Pearson has 12 goals and four assists this season.